In 2013 and 2014 the Columbia Basin Herald reported on the county wide drop in reported juvenile crime. See Below. Specifically, the county had experienced several years of apparently decreasing reports of juvenile crime. The question is why did the reports of juvenile crime go down? Was it policing? Was it schooling? Was it a change in the economy or local after school programs? The reality is that none of those things changed drastically in anytime relevant to the drop in reported crime. What did change however, is the amount of time, effort, and resources committed to juvenile prosecution by the prosecutor's office shortly before the reduction in reported juvenile crime began. Early prevention to break the criminal cycle requires proactive and competent juvenile prosecution and a commitment to sufficient staffing in juvenile crime prosecution by the elected prosecutor. Without this comittment the gains in community safety will disipate and rates will eventually go back up. EPHRATA - Ahead of his November re-election bid, Prosecutor Angus Lee released statistics this week showing a steady decline in juvenile crime since he took office in 2009. Crimes referred to the prosecutor's office and violent juveniles crimes have each dropped about 40 percent since 2008, according to the statistics. Nonviolent felonies and violent misdemeanors have each increased slightly during that period. Statistics show Grant County prosecuted 1,123 juvenile crimes in 2008 and 664 in 2013. Lee explained the reduction in juvenile crimes is due in part to his 2009 decision to allow his office to prosecute juveniles. Lee said he appointed an additional prosecutor to handle the cases as well. "Juvenile crime prosecution has always been a priority for me. In 2009 we started prosecuting with a focus on preventing future crime by making sure there were swift and certain sanctions for juvenile offenders," he stated. "This approach has paid off and we are seeing reduced crime from our juveniles." Grant County Juvenile Detention Center Director Warren Swanson agrees with Lee that the number of youth getting into trouble with the law is down recently, but said many other factors also contributed. He said Grant County and Washington have seen a reduction in juvenile crime for about 10 years because of court programs that are getting officials to more closely track serious offenders and even visit homes of repeat offenders. Swanson said those programs reduced the number of youth who continue to get in trouble. "It can be hard for the public to see, but there has definitely been a significant reduction," he said. "There's a lot more factors than just the prosecutor's office though, it is mostly sociological changes and the courts focusing on problem kids and putting resources toward those main problems," he said. Lee notes in order to reduce overall crime in Grant County, it is important to continue to reduce juvenile crime to deter future career criminals. Earlier this month he announced a more aggressive stance on prosecuting youth who skip school. "When we are talking about long-term crime prevention and reduction we need to talk about juvenile prosecution and truancy enforcement. Keeping kids in school and out of gangs will pay dividends in the future," he stated. EPHRATA - Juvenile crime in Grant County has seen a 25 percent drop in the last four years, according to Grant County Prosecutor Angus Lee. 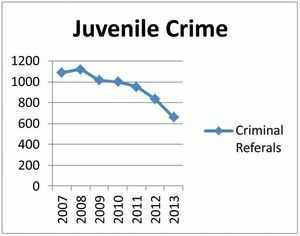 Since increasing by 3 percent from 2007 to 2008, there has been a steady decline in juvenile crime each year. The largest drop occurs most recently from 2011 to 2012 when there was a 13 percent decrease. "Juvenile crime has always been a priority for me," Lee said recently. "In 2009 we started prosecuting with a focus on preventing future crime by making sure there were swift and certain sanctions for juvenile offenders." In 2008, there were 1,123 requests to file juvenile charges. Four years later, that number dropped to 836 requests for juvenile charges. Violent crimes involving juveniles are also trending down. Lee stated there were only 25 violent felonies in 2012, down from 43 in 2007 and 2008. Lee attributes the drop in juvenile crime to effective policing by law enforcement and improvements to the juvenile division of the prosecutor's office. After an increase in juvenile crime in 2008, the size of the juvenile crime prosecution team was doubled. Despite the prosecution team doubling, there was no increase in the budget. After he was appointed in 2009, Lee reorganized the prosecutor's office and freed up enough money for a second deputy prosecutor. Lee believes that a major factor in decreasing crime is prosecuting proactively and hopes this approach will prevent juveniles from turning into career criminals. Being proactive toward juvenile crime instead of reactive has also translated to the Grant County Sheriff's Office. Grant County Sheriff Tom Jones stated his deputies have been diligently patrolling the streets and staying visible in the community in hopes of preventing juvenile crime. However, these numbers only reflect juvenile cases where charges were filed and doesn't take into account investigations where no charges were filed. According to Moses Lake Police Chief Dave Ruffin, the amount of juvenile cases in Moses Lake that were referred to the prosecutor's office in 2012 was 228. That number is down from 292 cases in 2011. Even though there seems to be a decrease Ruffin cautions that these numbers do not tell the whole story. "The unknown is what we have to be careful about," Ruffin said. Ruffin explained that officers may get a vandalism call or some other crime that is most notably committed by juveniles, but police might never find a suspect so no charges are filed. Quincy Police Chief Richard Ackerman said that he couldn't confirm if juvenile crime has decreased in the city because he didn't have the statistics in front of him. He said from what he has observed there seems to have been a decrease over the last few years. Ackerman attributes the apparent decrease to the city's Parks and Recreation Department setting up youth activities. Lee was unable to confirm if adult crime has decreased this past year because those statistics haven't been released yet.